Career & Business What is IFSC Code and MICR Code? 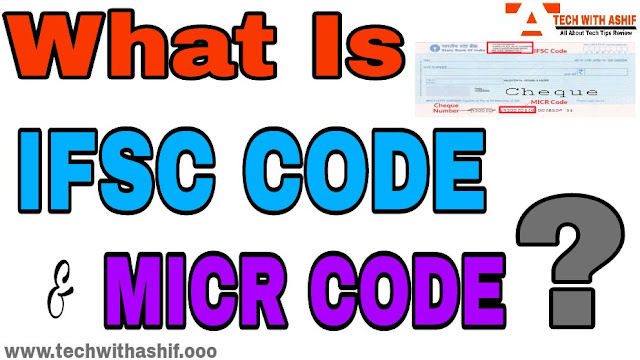 What is IFSC Code and MICR Code? Friends, You must have heard the name of the IFSC code and the MICR code but do you know what is the IFSC code and MICR code and it is said to be used. Two important codes are used in banking related work, first IFSC code and second MICR code. In this article we will know about the IFSC code and the MICR code. What is IFSC CODE ? In today's article, first of all know what is IFSC CODE and What is the use of it. The fullform of the IFSC code is INDIAN FINANCIAL SYSTEM CODE. IFSC CODE is the branch Identification code for any BANK. IFSC-CODE is 11-digit. IFSC CODE is the unique address of any bank. As is the address of our house. IFSC CODE is not same in any bank's branch. When we transfer money to any person's account, then we must also know the account number of its bank branch with the IFSC code. IFSC CODE is also written on our passbook, Which we can share with anyone and receive money in our account. NOTE:- IFSC CODE is used to transfer funds from IMPS, NEFT, RTGS and NET Banking. How to find BANK Branch's IFSC code? If you have to send money and you do not know the IFSC CODE of its bank branch, then you can easily find the IFSC CODE of that bank branch through ONLINE. To find out ifsc code of any bank in India, you can know by visiting the https://m.rbi.org.in/, using the bank's name and branch. The use of both the IFSC code and the MICR code is done by the bank to identify the Bank of Beneficiary while transferring money from one account to another. By which money can be transferred to the right account. Like all bank's IFSC code is different, the micr code of all bank branches is also different and UNIQUE. What is Bank MICR Code? The Full Form MICR Code is MAGNETIC INKCHARACTER RECOGNITION. The MICR, as its name suggests, is a code based on the character recognition technology. Which is used in bank check-clearing. This code is written in a line below the cheque, which is called the MICR band. Reserve Bank of India uses this code to identify and cheque-pass the bank branch. This code increases the safety of the cheque. MICR reader is used to read the MICR code. The MICR code is of nine digits, which is the identification number of the registered bank branch in the electronic clearing system. The first three digits in these nine digits show the name of the city, the next three figures show the name of the bank and the last three numbers tell about the branch. The micr code in the bank cheque is written in the bottom line of the cheque as you can see in the image above. MICR Code is written with a special type of ink, which will hold the case of fraud and also increases the security of your money. The micr code also prevents fraud in bank cheque, if you give a fake cheque, then it can also be identified on the basis of this number. How to know the micr code of any bank ? The micr code is written below your bank passbook and checks. If you do not have this code in the book, then online can also find it. Hopefully you may have liked the information related to IFSC and MICR and you may have known that, What is IFSC and MICR and how it works in FUNDS TRANSFER in RTGS, IMPS, NEFT and NET BANKING. You give your suggestion in the comments. what is Rupay Debit card & its Benefits ? What is UPI and how it works? Redmi 6 Pro Full Review: How is this smartphone in budget price ? Hello This is ASHIF SHEKH.My designation is BACHELOR OF COMMERCE (B-COM) in ACCOUNTS (hons) And i am just 21 year old.I am leaving in kuju Jharkhand INDIA. What is debit card and its types? What is Freelancing? And how to earn money from it? What is the bond and how to invest money in it? What is the share market and how to invest money in it? What is Mutual Fund? | Can money be earned from this? What is IMPS and how does it work? What is RTGS and How to use it? what is google pay (tez) Upi App ? What is NEFT And How it work? What is Net Banking & How to Apply?